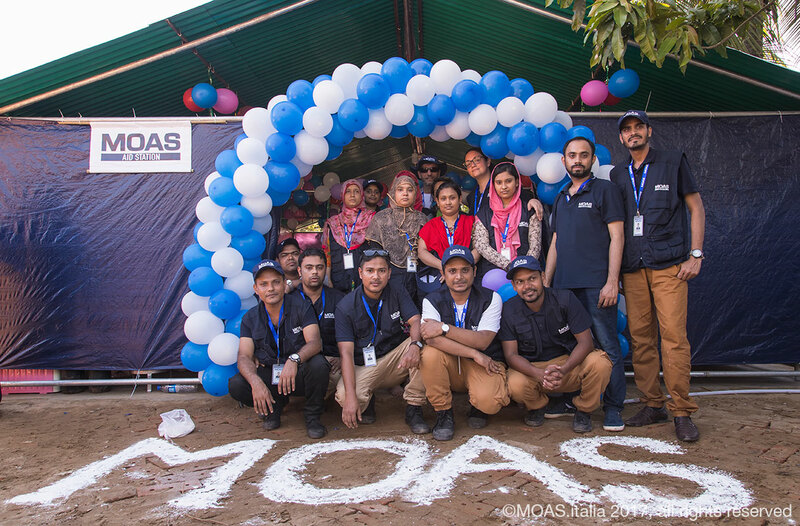 On 14th October 2017, MOAS inaugurated its first Aid Station in Shamlapur, Bangladesh, marking the first time the organisation is focusing its humanitarian efforts on land. The centre will provide much-needed medical care to Rohingya refugee and Bangladeshi host communities alike, particularly to pregnant women, new mothers and children in the makeshift refugee camps around the fishing village of Shamlapur. In response to the poor conditions in the makeshift camps and the high proportion of children, pregnant women and new mothers, MOAS has assembled a team of 49 Bangladeshi and Italian professionals, with a medical unit comprising a medical director, a medical logistician, eight doctors, six nurses, a midwife, two pharmacy assistants, and two medical data and reporting assistants with paramedic capacity. The team are delivering both primary and secondary medical services with a focus on antenatal, postnatal and paediatric care, and are working to address the high rate of malnutrition among children in Shamlapur, delivering preventative nutrition assistance to the many people at risk. Having assessed that the overcrowded and unsanitary conditions in the makeshift camps mean that outbreak preparedness is crucial, the Aid Station has been equipped with vital water and sanitation facilities. The team is ready to follow WHO’s instruction should a vaccination project commence, and are providing education and outreach within the community to help prevent the spread of communicable disease. “To provide medical care, the Italian NGO MOAS has started working here in Shamlapur. The vulnerable Rohingya population here will benefit from their work, as will the local community. They will get treatment for diseases like diarrhoea and cholera, while pregnant women will receive the care they need. As the local Chairman, I am grateful to MOAS for all the work they have been doing in this area. We in Shamlapur are very proud of our people. If you give us the opportunity, we will help you on the way. We want to find solutions together”, said Moulovi Aziz Uddin, Chairman of Shamlapur. Following the successful distribution of its first aid delivery, the MOAS vessel, the Phoenix, continues to work in support of MOAS’ ground operations by transporting sorely-needed aid shipments to relieve the strain on resources in Bangladesh. The next delivery is scheduled to arrive from Malaysia on 1st November. MOAS’s highly responsive operational and innovative model, combined with the international and local expertise of our team, mean that we are well-placed to deliver highly effective care, continuing MOAS’ history of providing specialised humanitarian interventions wherever they are needed the most. Regina Catrambone, Co-founder and Director of MOAS, says, “MOAS has chosen to stand up for the unwanted, the forgotten and the poor, whose only wish is to live in peace and care for their families. We will not sit back idle while the world remains indifferent to the suffering of the Rohingya. We have stepped forward to be there for them, offering medical assistance and support to give hope for a better future. More than half of the Rohingya camp population here are children under 12 years old, and women who have lost their husbands. Their desperation is immense, so it is important to be here to keep hope alive”. While MOAS continues to focus its energies is on delivering urgent medical assistance and supporting the host community, we urge the international community to act in support of Rohingya refugees and in solidarity with Bangladesh in mitigating this humanitarian crisis. Countless lives are at stake and the international community must mobilise urgently to prevent widespread outbreaks of disease and endemic malnutrition.